Both “break” and “continue” are the ‘jump’ statements, that transfer control of the program to another part of the program. C++ supports four jump statements namely ‘return’, ‘goto’, ‘break’ and ‘continue’. Java supports three jump statements ‘break’ ‘continue’ and ‘return’. The main difference between break and continue is that break is used for immediate termination of loop whereas, continue terminate current iteration and resumes the control to the next iteration of the loop. Let’s study the difference between break and continue in the context of C++ and Java. It terminates the execution of remaining iteration of the loop. It terminates only the current iteration of the loop. Control after break/continue 'break' resumes the control of the program to the end of loop enclosing that 'break'. 'continue' resumes the control of the program to the next iteration of that loop enclosing 'continue'. Causes It causes early termination of loop. It causes early execution of the next iteration. Continuation 'break' stops the continuation of loop. 'continue' do not stops the continuation of loop, it only stops the current iteration. Other uses 'break' can be used with 'switch', 'label'. 'continue' can not be executed with 'switch' and 'labels'. In C++ break has only two uses i.e. first it is used to “terminate the execution of a case in switch statement”. Second, to “terminate the loop and resume the control to the next statement following the loop”. But in Java break has three uses first, it terminates the case in the switch, second to terminate the loop enclosing break and third, as mentioned earlier that Java do not provide a ‘goto’ statement but, the extended form break can be used in place of ‘goto’. Let us see, each use of ‘break’ in detail. First use to terminate the execution of case in switch. The break in switch only affect that switch which encloses it, it does not affect the loop enclosing the switch. //using break in switch in context of C++. Second use, to forcibly terminate the loop and resume at next statement of the loop. As soon as, the break statement is encountered inside the loop, that loop is immediately terminated without executing the remaining code in the body of that loop and the program control reaches to next statement written after that loop. if(i==10)break; // as the condition inside 'if' satistfies control comes out of 'for' loop. break only let the program exit the loop which encloses it. If the break is used with nested loop, it break out only the innermost loop and do not affect the outer loop. The third use, using the break as the form of goto. Java uses break as form of goto without its problem. As goto provides an unstructured branching which is hard to understand and also goto prohibits compiler optimization, Java uses an expanded form of break which is similar as goto and helps to exit more than one block at a time and resume the control of the program to the end of labeled block, mentioned with the break statement. Here,”label” is the name of a certain block of code or an identifier in Java, and this labeled block must enclose the break statement. The labeled break statement is used to exit from the set of nested loop. 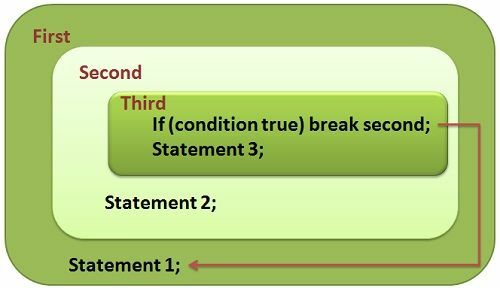 As the labeled break statement is encountered the control exits the labeled block which is mentioned with the break statement. In this code, as the control reaches the third block, its print statement gets executed and after that the control resumes to the ‘if’ statement, and as it is satisfied, the break statement with the label is executed. Label attached with break is first, so control resume to the statement written after the end of block first i.e. in the main block which is a print statement and that gets executed. As break terminates the remaining iteration of the loop and lets the control exits the loop, here, continue works somewhat work like a break. The continue statement stops the execution of remaining code in the loop for that current iteration and resumes the control to the next iteration of that loop.The continue statement skips the code for the current iteration and passes the control to the next iteration of the loop. Let’s understand it with an example. // using continue in context to C++. //it prints the even number till 100. 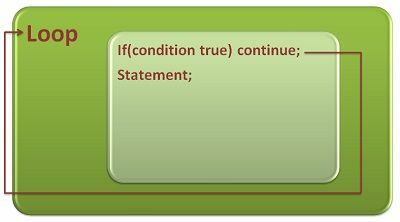 In the above program, If the ‘if’ statement is satisfied then, continue statement executes, which do not allow the following print statement to execute and resume the control to the next iteration of ‘for’ loop. If i=1 then the ‘if’ condition is satisfied and continue gets executed, without executing the print statement for the odd value of ‘i’ and, the control resumes to the next iteration of the loop ‘for i=2’. If i=2 then ‘if’ statement is not satisfied hence; continue does not execute and print statement prints the value of ‘i’ which is even. Basically, break keyword terminates the rest of remaining iterations of the loop. On the other hand, the continue keyword terminates only the current iteration of the loop. Once the break keyword executes, the control of the program exit out of the loop and resumes to the next statement after the loop. In case of continue keyword, the control of the program resumes to the next iteration of the loop. As above step concludes, that after the execution of break control of the program exit out of the loop it is clearly understood that break causes early termination of any loop. On the other hand, continue only terminate the current iteration and resume to next iteration of the loop then we can say that continue causes early execution of the next iteration of the loop. The break keyword terminates all the remaining iteration after its execution so we can say that it stops the continuation of the loop whereas, the continue keyword still continues the loop execution. The break keyword can be used along with the “switch” statements as well as “label” whereas, continue keyword can not be used with “switch” and “label”. The break and continue statement both are the jump statement that transfers the control to another part of the program. Where break statement let the control exit the loop, the continue statement let the control to the next iteration of that loop. I think the explanation is best ……….it provides a good writing way and an understanding concept.